August 15th is the feast day of the church & after religious services, the locals celebrate with food, wine, dancing & music. Visitors are welcome. Panagia Episkopi was built in the late 11th Century by Emperor Alexios A’ Kominos. The church is an important Byzantine monument. 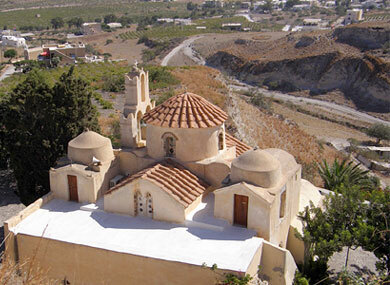 It houses the icon of Panagia Glikofilousa, one of the third most priceless portable icons in the world.
" To every Greek, either coming as a simple visitor or as a faithful to pray, this church, inspires both a strong national and religious feeling. A great number of the treasures of the church such as liturgical and ecclesiastical books, priests vestments and holy vessels were destroyed by the 1915 fire. Only icons had come out safe from the catastrophe. It is said that a hand covered them by the fire and protected them from being burned. It must have been the invisible hand of the Virgin Mary." The church has survived the invasions of Venetians, Francs, Russians and Turks and still remains as an inspiration to the islanders. Panagia Episkopi was built in 1115, but had to withstand not only invasions and fires, but the tremendous earthquake of 1956. Any damages incurred by all these elements were quickly repaired by the faithful. The church is not only known for its ecclesiastical architecture. It is also admired for its remarkable Byzantine paintings and hagiography. A number of important icons can be seen in the church, although it bears to mention that 26 of the finest works were stolen in 1982 and never to be found.